I Lost a Tooth, How do I replace it? If you've ever gone to the dentist for a routine checkup, only to discover you need a BruxZir crown for tooth #9, you have probably wondered, "What does that mean?" Find the answers to some common questions below. 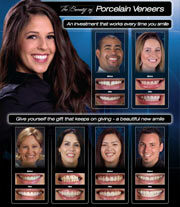 Have you ever found yourself thinking, “I don’t like the look of my teeth” or “I don’t have the smile I want”? Most of us have. Our teeth can become discolored, chipped, cracked or even rotten through the rigors of normal daily use. Undoubtedly you have been told that you should brush and floss daily, as well as visit your dentist at least every six months – but what is your option if, like most people, you haven’t taken the best care of your teeth or if you can’t even remember the last time you visited a dentist? Well, it’s never too late to start. 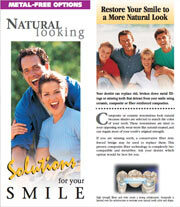 With the help of your restorative dentist, your smile can become picture perfect! These professionals give your smile a beautiful look and strong, comfortable functionality, even if you never had either in the first place. In some cases, it could even take as little as a single appointment! Restorative dentistry is the field of dentistry that focuses on the rehabilitation and restoration of the teeth and gum tissue to desired function and esthetics. A major focus of restorative dentistry is saving the patient’s existing tooth structure in some way, rather than simply removing the tooth in its entirety and replacing it with a man-made substitute. In the United States, restorative dentistry is not an American Dental Association defined specialty; dentists who perform these types of procedures are just classified as general dentists. However, these professionals have attended and graduated from at least four years of dental school as well as passed a rigorous national written exam and a regional clinical licensing exam in order to practice dentistry. Restorative dentists who wish to further their specialization can attend advanced training to become endodontists, periodontists and prosthodontists. What are my restorative options? While treatment options for a patient are ultimately up to the expertise of the dentist, there are several common solutions that can restore a smile. 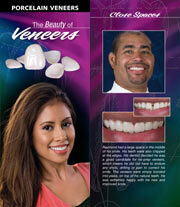 A dentist may provide you with a variety of treatments, such as placing veneers, crowns or a bridge. These solutions are called restorations, which are man-made tooth substitutes that replace or cover your existing tooth. You might think you need an orthodontist to fix gaps and crooked teeth; however, a restorative dentist can use a combination of reduction techniques and the placement of restorations to make teeth straight. That’s right — not every patient needs years of wires and brackets to fix their smile! A common solution to fixing a patient’s tooth is placing a restoration, such as a crown or bridge. A crown is a tooth-shaped restoration that slips over the patient’s prepared tooth and is secured in place with cementing chemicals. 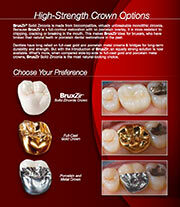 Crowns can be made from precious metals or ceramic materials, or most traditionally a combination of both. Modern crowns match natural teeth in color and appearance, making it difficult for people viewing your smile to know that you have a replacement tooth. Bridges are very similar to crowns, except they serve an additional purpose. Bridges replace missing gaps in your arch. To fix a gap created by a lost tooth, a dentist will reduce the teeth on both sides of the gap and then place a bridge that connects the two teeth and the in-between space as one unit. Essentially, a bridge is a replacement tooth that fills in an empty space while being structurally connected to at least one additional tooth for support. 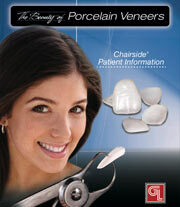 Download PDF brochures to view the benefits of choosing BruxZir Solid Zirconia Crowns & Bridges. You must have Adobe Acrobat Reader to view this file type. 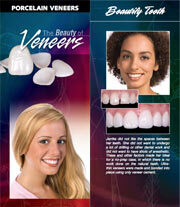 Download PDF brochures to view the benefits of choosing veneers. You must have Adobe Acrobat Reader to view this file type. 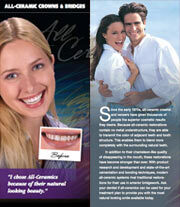 A simple non-permanent solution for protecting the color of your teeth is through the use of whitening agents. Dentists use a variety of chemicals and methods in order to transform the color of a patient’s teeth. Although there are over-the-counter whitening products available, most often solutions prescribed by a dentists are much safer and more effective. One professional solution is a custom tooth-whitening tray. Custom tooth-whitening trays are plastic devices that slide over your entire arch in order to hold the whitening solution to your teeth. The advantage with whitening trays prescribed by a dentist is that they are custom-designed to fit in a specific patient’s mouth, allowing the whitening solution to be better distributed and applied. I Lost a Tooth. How Do I Replace It? Please fill out the form below to request a list of local dentists who prescribe your product of interest. Many people dislike the thought of going to the dentist because they associate dental procedures with large amounts of pain. The drilling, scraping and injections that people often fear do exist in dentistry; however, avoiding the dentist due to these fears will undoubtedly cause more serious pain and damage than visiting a dentist regularly. With the help of modern technology, most restorative dentists have methods to help the patient experience as little pain as possible. On top of this, dentists genuinely care about the health and experience of their patients meaning that they want you to have a positive office visit. Once you’re pumped up and ready to go, what should you expect at the dentist’s office? When meeting your new dentist for the first time, you will likely have a talk about what problems you personally have with your teeth, as well as discuss your desired outcomes. Combining your concerns with a thorough initial examination, the dentist will propose a treatment plan. This treatment plan could include placing a restoration such as a veneer, crown or bridge. When placing a restoration, the dentist will likely be forced to remove some of the existing tooth structure. To do this, the tooth is ground down using a high-speed spinning bur attached to a handpiece to provide room for the new restoration. The dentist then will mix a putty-like substance and place it in a tray in the mouth against the teeth. This material sets quickly and forms an impression of the reduced tooth. From this impression, a stone model is made that aids in the manufacture of the final restoration. In the meanwhile your dentist will place a temporary restoration so that your wont have a gap in your smile while the final restoration is made. At the next appointment, the man-made restoration is cemented over the old, reduced tooth to act as your new permanent tooth.